Imagine being able to wakeboard, water ski, wakeskate, wakesurf, kneeboard…anywhere in the world! With over 1,500 water sport listings from 81 countries throughout the world, WakeScout provides comprehensive information about all the entities worldwide that will get riders and skiers on the water. 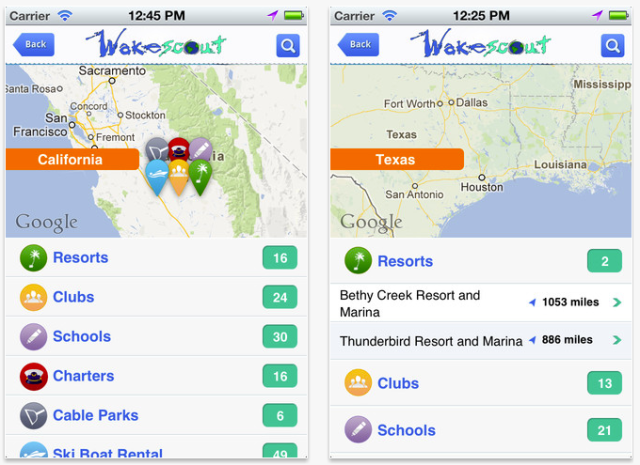 The WakeScout app provides 4 ways for riders and skiers to locate places around the world to wakeboard and waterski! 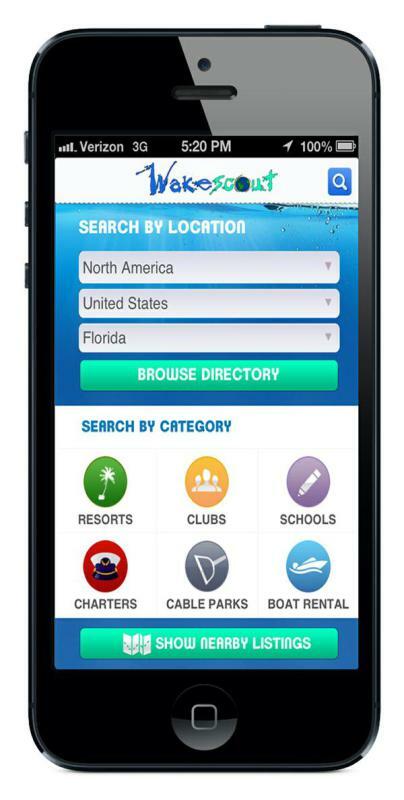 -Locate all the WakeScout water sport listings within 100 miles of your current location with just 1 click! Simply click on “Show Nearby Listings” and choose a radius you would like to explore. You will find a complete list of water sport entities within the radius you have selected. -Browse the WakeScout directory by entering the country you are interested in exploring. You may also browse by state / province for water sport listings in the USA and Canada. RESORTS We have listed resorts offering waterskiing, wakeboarding, kneeboarding, etc. to their guests. This activity will be either on-site or a very short distance from the resort. CLUBS The clubs we have listed welcome non-members to join them for a day, providing an opportunity to water ski, wakeboard, kneeboard, wakesurf, etc. anytime you’re away from home or just looking for a club to join. SCHOOLS We have listed schools offering instruction and training in a variety of water sport disciplines. CHARTERS The charter services listed will take you out on the water so you can enjoy your favorite water sport by providing the boat, driver and equipment. In most cases they also offer instruction. CABLE WAKE PARKS We have created listings for every cable park in the world. No boat required. Just show up, grab a handle and hit the water. MARINAS We list marinas that offer ski and wakeboard boats for rent, as well as waterskis and wakeboards if you are traveling without your gear. -Search by city, state/province, country or listing name. Simply enter the name of the city, state/province, country or the name of a water sport entity in the search box to get a complete list of WakeScout listings matching your search. -Whether there is access to a slalom course, jump, rails, kickers, sliders, including descriptions of all the obstacles at the cable wake parks. -The manufacturer, model, size, type and horsepower of the boat(s) in use. -The brand of equipment available for use in case you are traveling without your gear. -Complete contact information: Address / Telephone / Website / E-mail / Facebook. With over 1,500 water sport listings from 81 countries throughout the world, WakeScout will help get you on the water to enjoy your favorite water sport.